Yale University Press, New Haven and London. Other information from a church guide of about 1970. 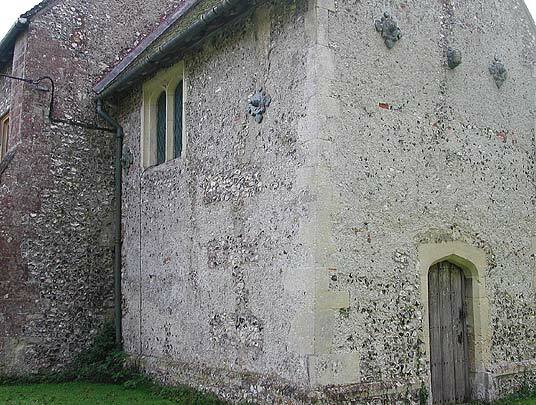 The Saxon details of the church are described below. 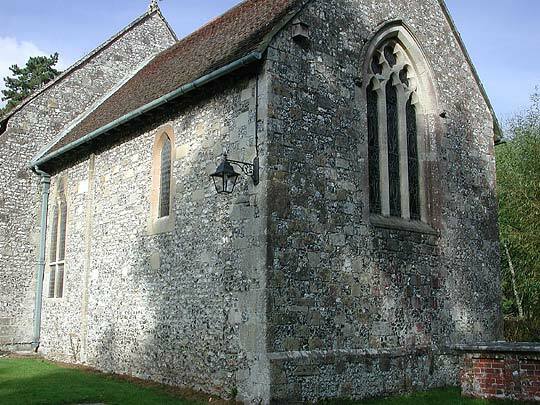 This view of the south side of the church shows several additions and restorations since Saxon times. 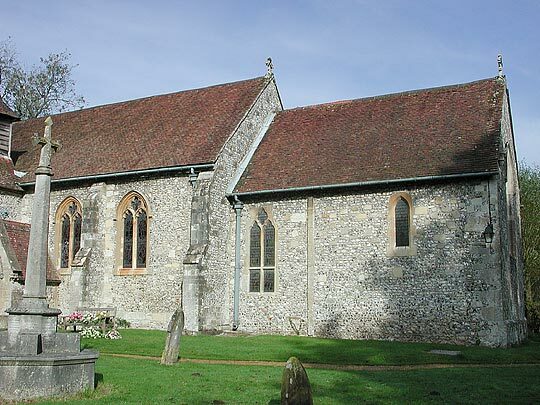 In the early 13th century, the south-west tower was added, the south wall of the nave was rebuilt, and the chancel was extended to its present length (with lancet window typical of the period). 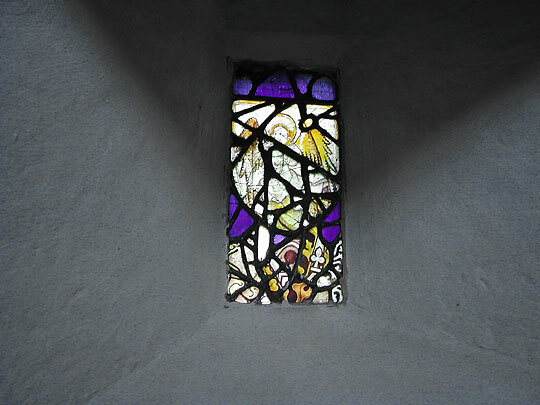 The larger chancel window is probably 14th century. 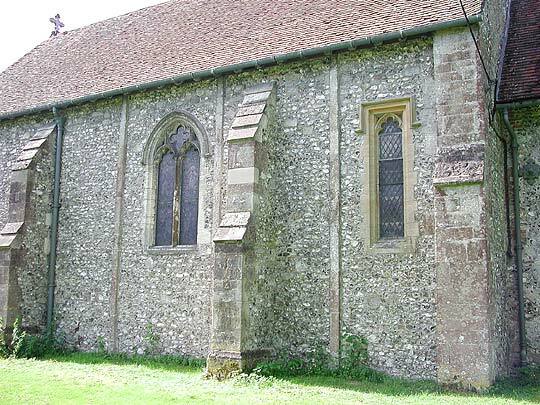 The Perpendicular nave windows were inserted in the 15th century. 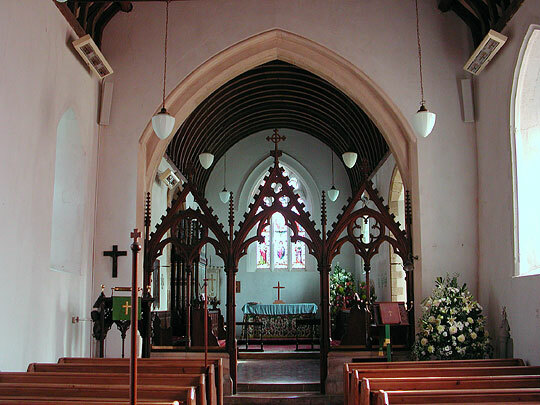 The porch was added in the 19th century as was the chancel east window in the early 14th century style (see picture below). 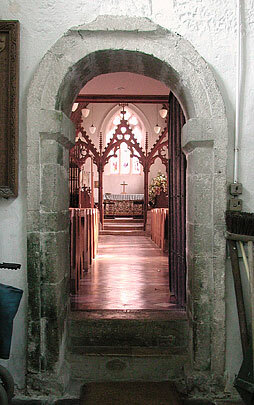 Saxon in the chancel the long-and-short quoins and one lesene, in the nave also (north side) long-and-short and three lesenes and the re-set tower arch which was the S doorway. 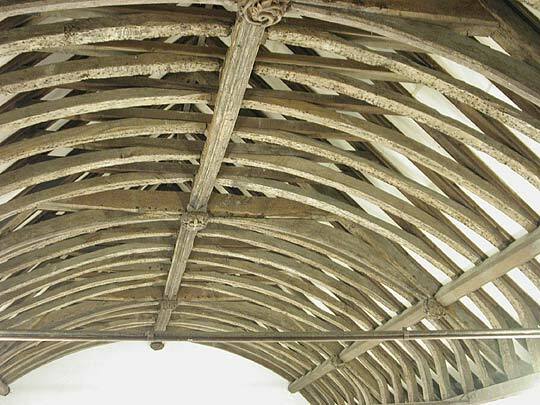 Narrow and high, with jambs and arch accompanied in a typical way by lesenes and an arched band of the same width. The VCH (Victoria County History) attributes the W attachment to the C16 (e.g. 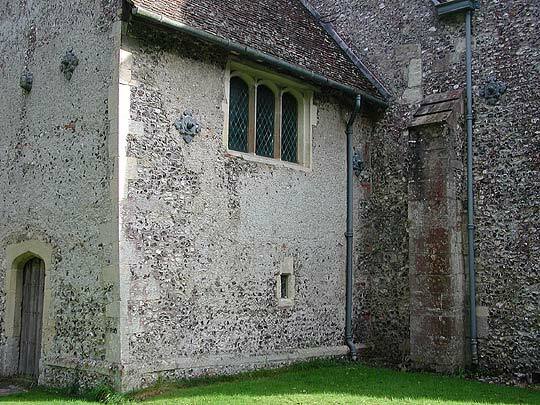 the windows), but the quoins surely have fragmentary long-and-short work. The dating of the attachment is important, because on it on its E wall, i.e. 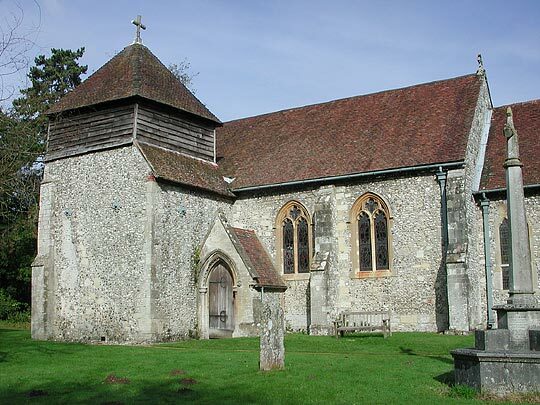 the outer W wall of the church, is an overwhelming ROOD in relief: Christ, the Virgin, and St John. Unfortunately they have been totally chiselled off by ill-advised fanatics, so that only silhouettes remain. 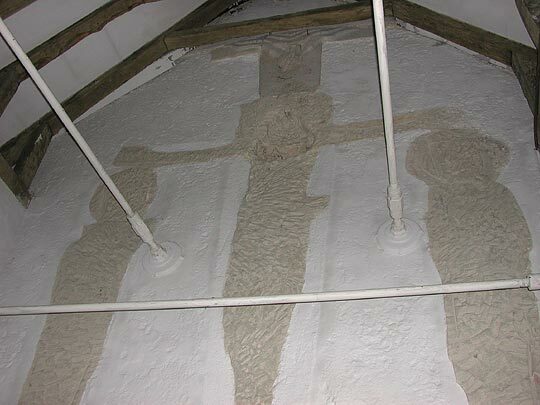 But they show that these were well over life-size figures, that the grouping was the same as at Breamore, and that Christ resembled the Christ of Romsey, and that above him - and this one part is intact - is the hand of God appearing out of a cloud, exactly as at Romsey. The Continent about the year 1000 has nothing that can compare with this monumental three-figure group. 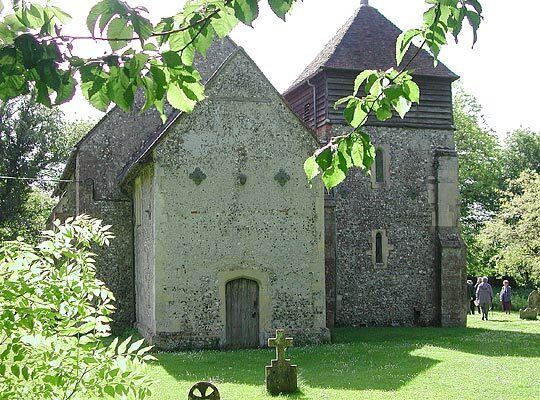 In the C13 the church received a SW tower. 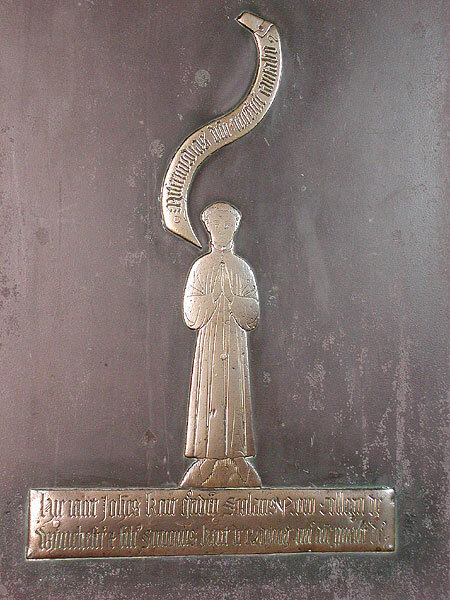 Brass to John Kent, died 1434. Scroll thrown up above his head. A 12 in. figure. John Kent was a scholar of Winchester College in the early days of its foundation. The Latin inscription on the scroll means: "My song shall always be of the loving kindness of the Lord."